See scan - perfect condition. This is a nice and very rare early Soviet Russian USSR pioneer spacecraft / rocket flight cosmos pin of the 2nd cosmonaut flight of VOSTOK-2. 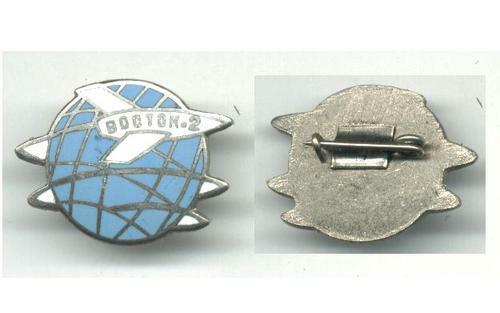 The pin/ badge is silver and has a great blue enamel. It is a genuine and authentic piece from the date of the flight. This was the second manned orbital flight. The Soviet Union successfully launched Vostok II into orbit with Gherman S. Titov as pilot. The spacecraft carried life-support equipment, radio and television for monitoring the condition of the cosmonaut, tape recorder, telemetry system, biological experiments, and automatic and manual control equipment. After 17.5 orbits, the spacecraft reentered on August 7 and landed safely at 7:18 GMT near Krasny Kut, Saratov. Titov made a separate parachute landing in an ejector couch. Flight objectives: Investigation of the effects on the human organism of a prolonged flight in orbit and subsequent return to the surface of the Earth; investigation of man's ability to work during a prolonged period of weightlessness. Titov took manual control of spacecraft but suffered from space sickness. He was equipped with a professional quality Konvas movie camera, with which ten minutes of film of the earth were taken through the porthole. Both television and film images were taken of the interior of the spacecraft. Like Gagarin, Titov experienced problems with separation of the service module after retrofire. Titov was never to fly again, after being assigned to the Spiral spaceplane, which turned out to be a dead-end project. A biography of him by Martin Caidin ('I Am Eagle') made him somewhat more accessible than Gagarin to the West. Very nice and rare early space collector piece and one of the rare Russian badges / pins.